Build, edit and fine-tune color profiles with expert control. 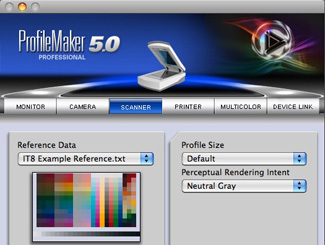 Designed for the professional fine art and commercial photographer, ProfileMaker™ 5 Platinum ensures accurate and consistent color for all of the devices in a typical studio workflow, so you can save time and money while enhancing output quality. If you’re a professional fine art or commercial studio photographer with a discerning eye for color, the highest quality profiles are a must. 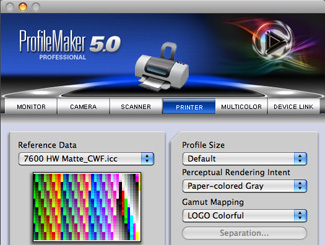 When paired with an i1 measuring device, ProfileMaker™ 5 Platinum helps you connect each step in your color imaging workflow by creating and editing high quality, reliable ICC profiles. Achieve the most accurate digital color with highest confidence that it will remain consistent on each input, display and output device. Digital Camera Module – Create ICC profiles for digital cameras. Scanner Module – Create ICC profiles for flatbed or drum scanners. Monitor Module – Calibrate and create ICC profiles for CRT, LCD and laptop displays, plus match multiple monitors to a reference monitor. Printer Module – Create ICC profiles for RGB and CMYK output devices. MultiColor Output Module – Create profiles for MultiColor devices featuring CMYK plus up to 6 additional channels including Hexachrome®. Includes the ability to set ink priorities, minimize ink consumption and minimize metamerism for two different illuminants. Includes Photoshop® Plug-Ins for soft/hard proofing and multicolor separations. Editor Module – Globally or selectively edit profiles or fine-tune the ones you’ve created by working with lightness, contrast, saturation, white point or gradation curves. Check spot color reproducibility and view gamuts in 2D or 3D. ColorPicker Module – Convert spot colors (CxF or Pantone) to process colors, individually or as a complete library. Limit the maximum number of device channels and define the minimum ink coverage for higher process stability. MeasureTool Module – Collect, analyze and average data from color measurement devices for accurate profile computation. Create your own custom test charts to achieve the most accurate output profiles. Evaluate density, dot gain, gradation curves and color for complete process control. Don’t have an i1 device? 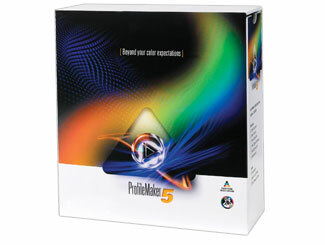 ProfileMaker 5 Platinum is bundled a variety of ways, allowing you to choose the functionality that is most important to you. 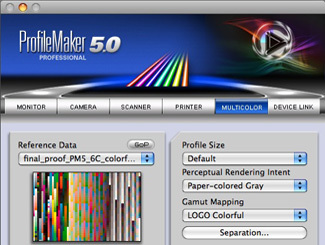 In addition to ProfileMaker 5 Platinum software, this package includes an i1 Pro - the industry defacto standard for high quality semi-automated profiling. Available in NoFilter or UVcut, i1Pro can be used to profile all devices in your workflow, including monitors, scanners, printers and projectors, plus measure ambient and flash lighting. It even measures spot colors for important corporate identity shoots to ensure color consistency. One device does it all! i1iSis (A4+) Chart Reader, the automated solution for high-speed measurement of A4+ and letter size test charts with up to 1,100 patches. Includes UVcut and NoFilter dual reading ability. Optical Brightener Compensation Module (OBC), which compensates for color shifts caused by the Optical Brightening Agents used in many papers. i1iSis XL (A3+) Chart Reader, the automated solution for high-speed measurement of A3+ and tabloid test charts with up to 2,500 patches. Includes UVcut and NoFilter dual reading ability. 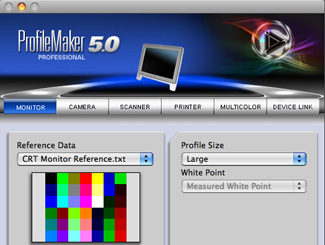 ProfileMaker™ 5 Platinum software allows you to create and edit ICC profiles for each of your professional photography workflow devices. Device Link – an optional add-on module that enables device linking workflows for RGB and CMYK color spaces. Build direct connections between source and destination imaging devices to handle special applications like output-to-output transformations. +What Software Supports the CxF Data Format? -Separation Settings - Where to Define? +Why do all my colors look wrong in i1Share? -Can I Add Color Channels to an Existing Profile with GOP? -Logo Classic, Chroma Plus & Colorful - What's the Difference? -Printer Profile has a Blue Color Cast - Why? +Monitor: How Bright Should It Be? 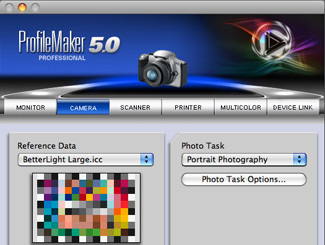 "As a user of ProfileMaker software since 1995, it has been my professional tool of choice that provides me with high-level color control for both my original digital prints and . . ."